In December I was working on some Christmas gifts and you all had a good guess at what I was making. If you've found Purfylle on instagram since I joined you would have seen I gave the game away. I still haven't shared the finished project though, so here it is! I wanted to create the pixelated look that Minecraft is known for. 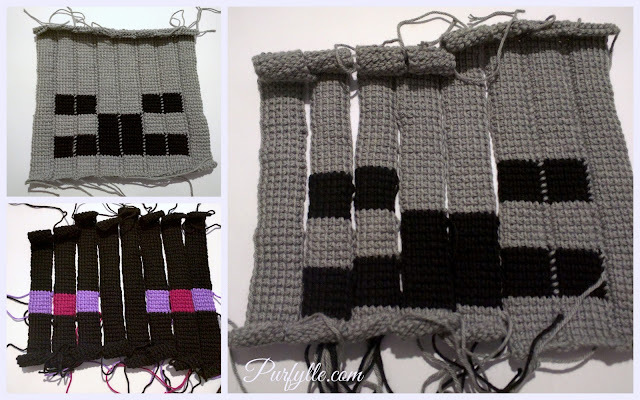 To achieve the look I was after for the Minecraft bags I decided to make each 'pixel' separately out of little crochet squares. Making the squares in Tunisian crochet would also add to the computerised look. You can make your squares any size that suits you, your stash and your project, but I was on a deadline and decided smaller was better. I also wanted to keep the number of squares to a minimum so I chose characters designs that worked in a 8x8 grid. I ended up mostly working from the mobs designed by Pugwis. To create the Minecraft bags I used little Tunisian crochet 6x6 squares. insert hook into second chain from hook, yarn over and pull up a loop; *insert hook into next stitch, yarn over and pull up a loop; repeat from * until you have 7 loops on the hook. NB: leave long tails at the start and end of each square as you will use these later to stitch your squares together. 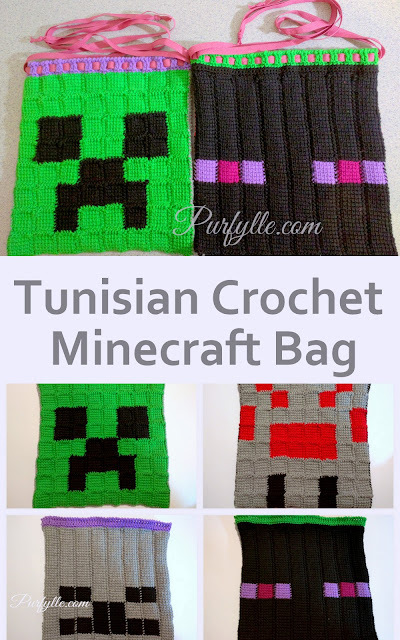 Follow Purfylle's board Minecraft Crochet & More on Pinterest. An 8x8 grid pattern requires 64 squares. I kept loosing count of how many squares I had (probably because I was also watching TV) so I laid the squares out in the grid which was much easier to follow, I didn't even have to count them doing it that way, with a larger project laying them out would have been a bit trickier. I joined the squares in pairs and then in strips across. This meant I could join the rest as rows and the work went faster. I was running out of time very quickly. To speed things up I made Enderman and Skeleton by working in strips instead of squares. 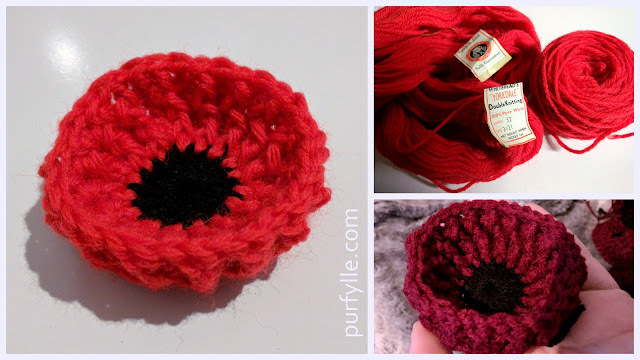 The pattern crocheted up much faster and this method also saved a lot of time on stitching. I'm not as happy with the final look though. Once all the squares were stitched together and the ends worked in I blocked each piece by wetting it under the tap and then pinning it out flat and leaving it to dry overnight. With the blocking done I joined Creeper to Skeleton and Enderman to Spider. 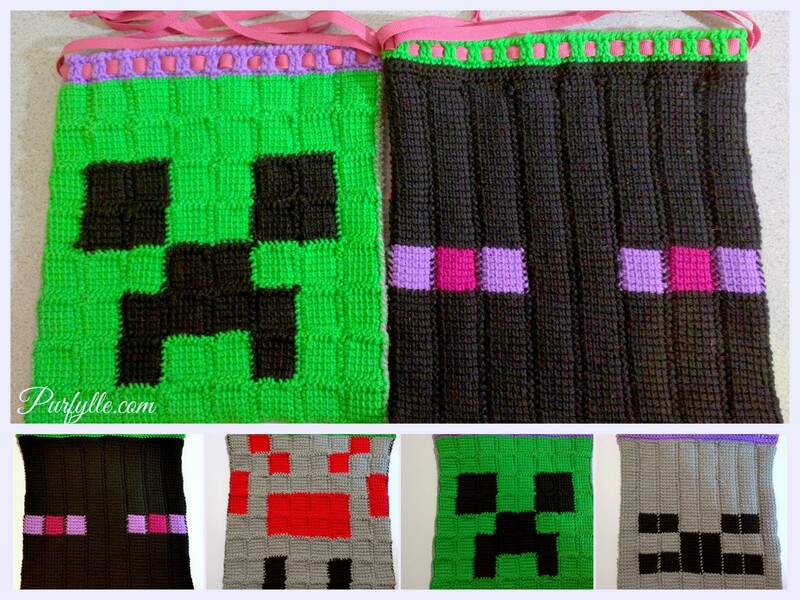 For the Creeper-Skeleton bag I used violet yarn to double crochet around the top and for the Enderman-Spider bag I used green. To create the drawstrings it was just a matter of weaving the cotton tape through every second double crochet stitch. This would be a good project to learn with. TY! I wonder what happened to my original reply? totally cool! So funny was thinking about that what is it post the other day glad to have the mystery solved! 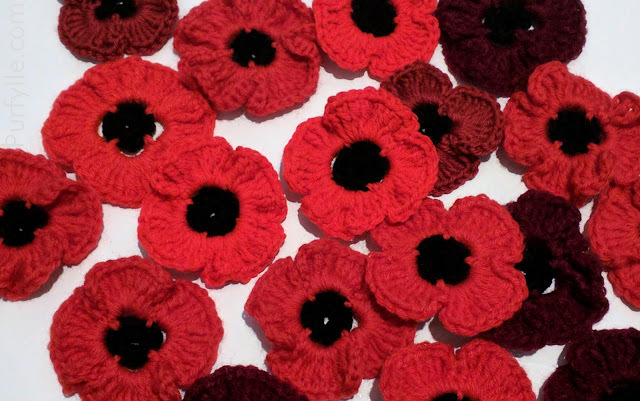 Oh Winnie, how sad that it is hard for you, my Nanna taught me to knit and it reminds me of her too. Really cute bags! 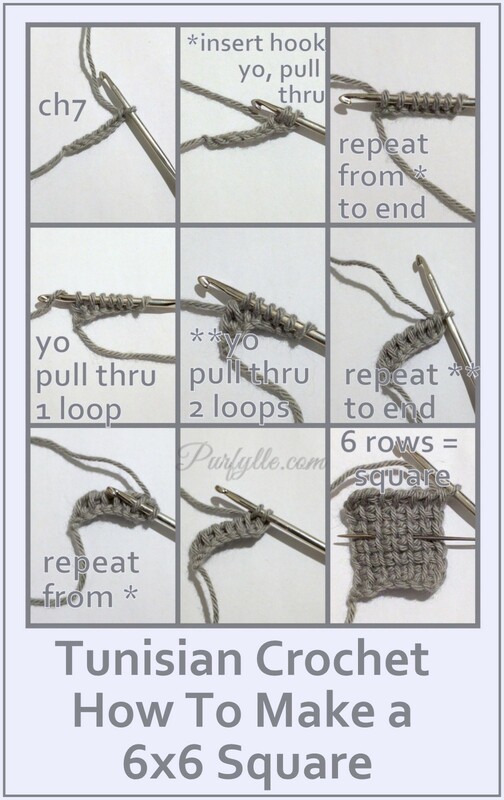 I need to try Tunisian crochet soon. My hubby really likes Tunisian crochet because it doesn't look like 'grandma made it' You must give it a go, if you work in narrow strips you don't need a special hook. My kids love Minecraft soooooo much, I just have to give this a go. Pinning so I can save it for when my Tunisian gets better... My rows are still kinda wobbly. Awesome pattern. Thank you! The first time I worked Tunisian my rows were so tight. My crochet in general has gotten a lot better since then. I find it's easier to get regular rows with a smaller hook and yarn in Tunisian. I love them! I wish I saw this before the weekend. I just hosted a minecraft party for my 7 year old (which i just blogged about!). I might make him one now anyway! I'm glad the party went well. Did you end up making this for him? I'd love to see pics, I'm heading over now to see if you've blogged about it. Sorry for the late reply, I thought I already had. oh my gosh. That looks like a lot of little squares to join. It must have taken forever to weave in the ends. 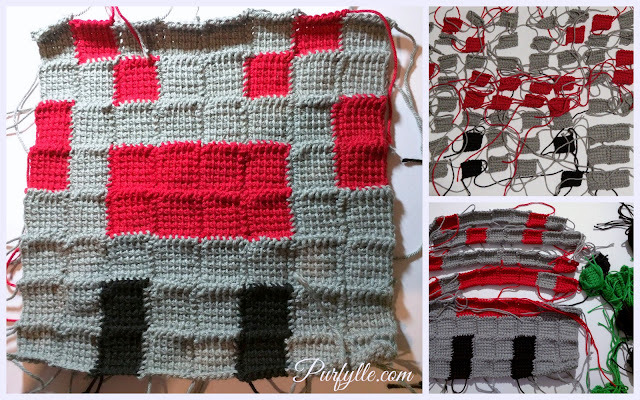 I really wanted to get that pixel look that minecraft has by stitching the squares together. It did take a bit of time, but you could just join as you go too.